I have come to the realization that my tastes have been changing lately. There’s a number of things I now like that I didn’t used to. Cabbage is one of them! This opens a whole new world for me. There’s a delicious Indian cabbage recipe that I love and coleslaw (I don’t really love the kind with mayonnaise a lot). I feel great that I now have these new things open to me! 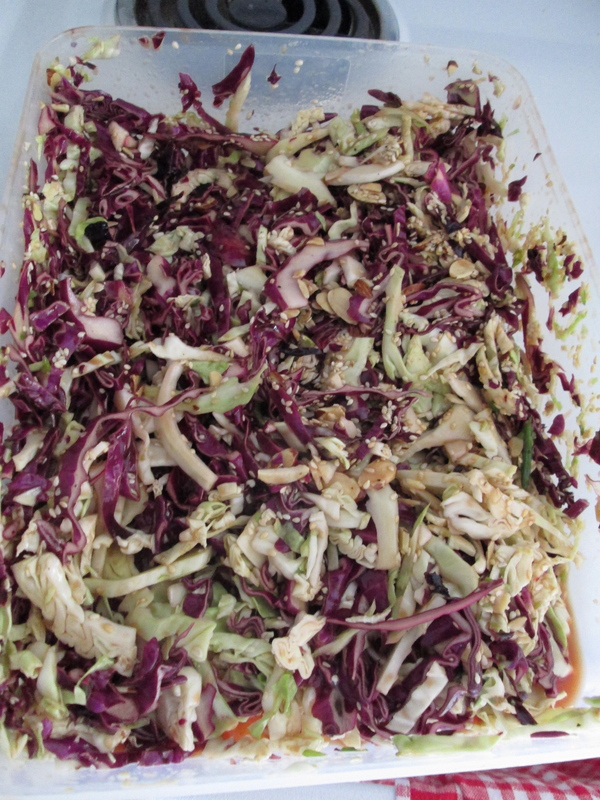 Today I tried an Asian Cabbage Salad recipe. The recipe is designed to be paleo-friendly, but I am not paleo. Therefore, I felt completely comfortable substituting in non-paleo soy sauce. I also doubled the recipe. 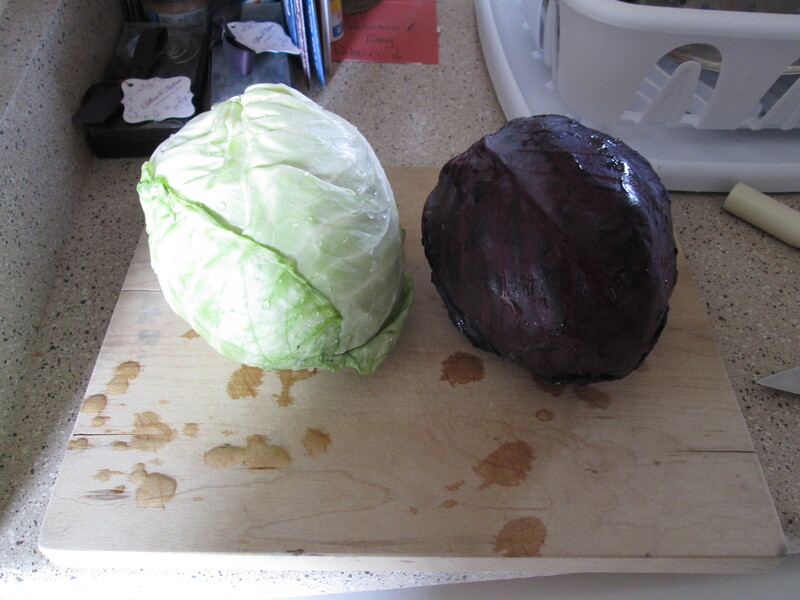 I was happy to use my food processor to shred my cabbage too. It went SO fast! I think it only took me 20 minutes or so to wash everything and put it all together. As a new recipe, that’s pretty good for me. I’m not the most efficient when making new things. 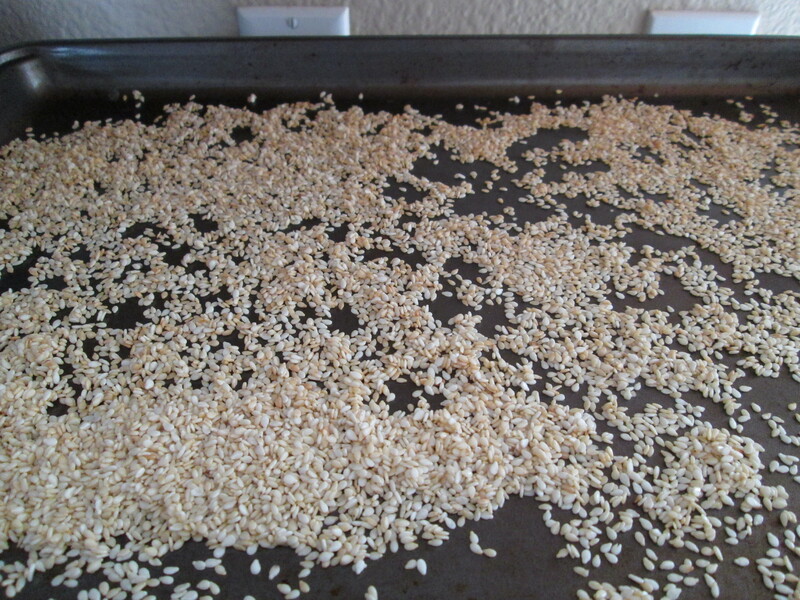 First, I realized I didn’t have toasted sesame seeds, but I had raw ones! So I had to toast them. I was feeling a little paranoid about burning them because they are so small. 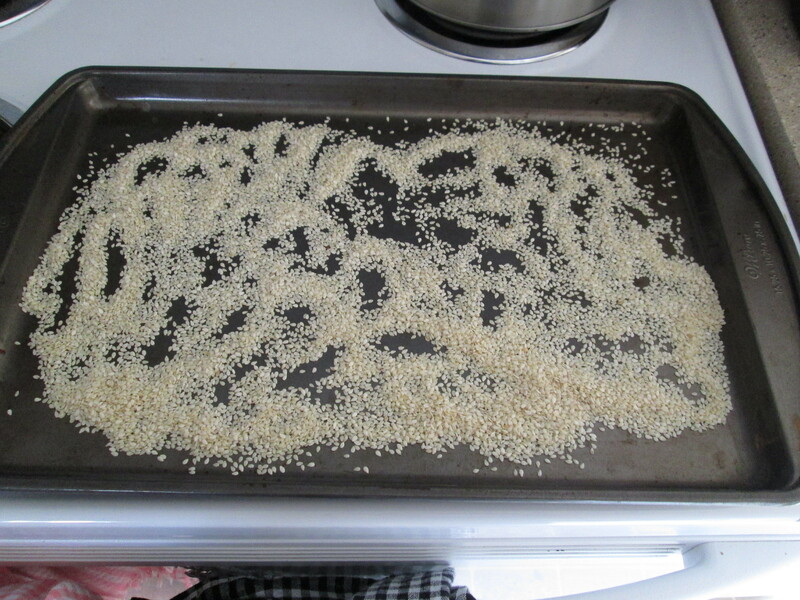 My original plan was to toast them in the toaster oven so I could watch them the whole time, but 6 tablespoons of sesame seeds is more than I thought! I was able to chop about half the cabbage in the food processor while they toasted. I checked them constantly… I also noticed that they continued to toast a little on the hot pan after I took them out of the oven, so don’t over-toast (I forgot to take a pic after they sat a bit)! I used the oven at 250 degrees Fahrenheit. It probably took well under 5 minutes. I didn’t let the oven fully preheat before I put in the seeds because I’m impatient, but I did let it heat up to being pretty hot because I wanted them to toast quickly. I did not measure the honey at all. In fact, I’m not sure if it’s really necessary. 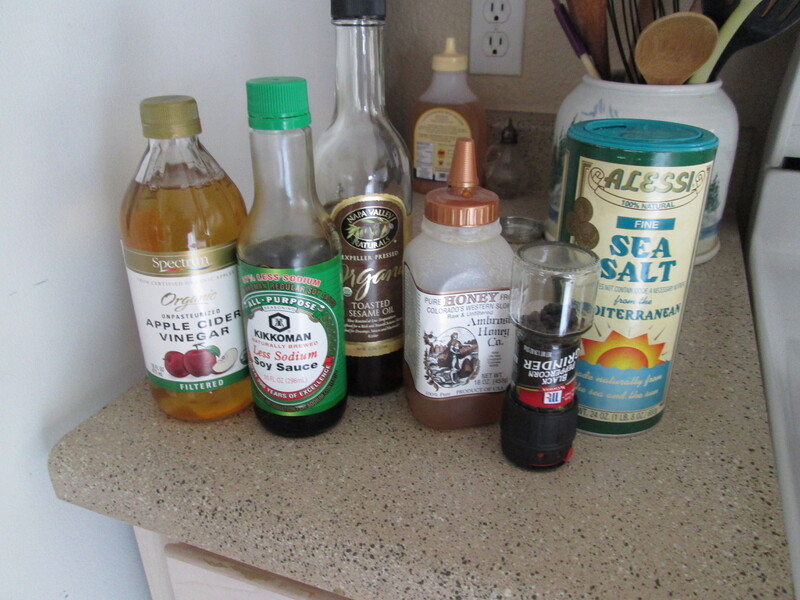 I also noticed that that much vinegar, soy sauce, and sesame oil is a TON! I may try cutting down the dressing next time. 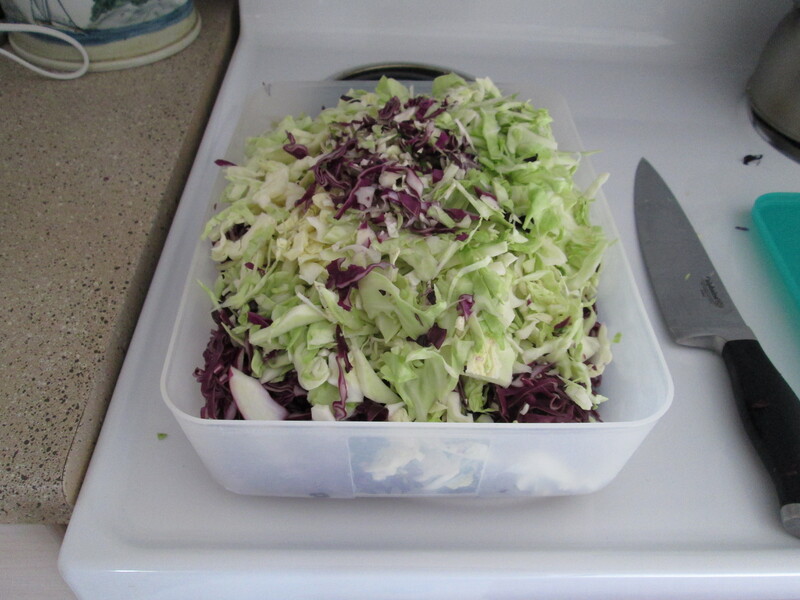 The giant pile of cabbage…too big for my container! This is how much salad it made! Tons! 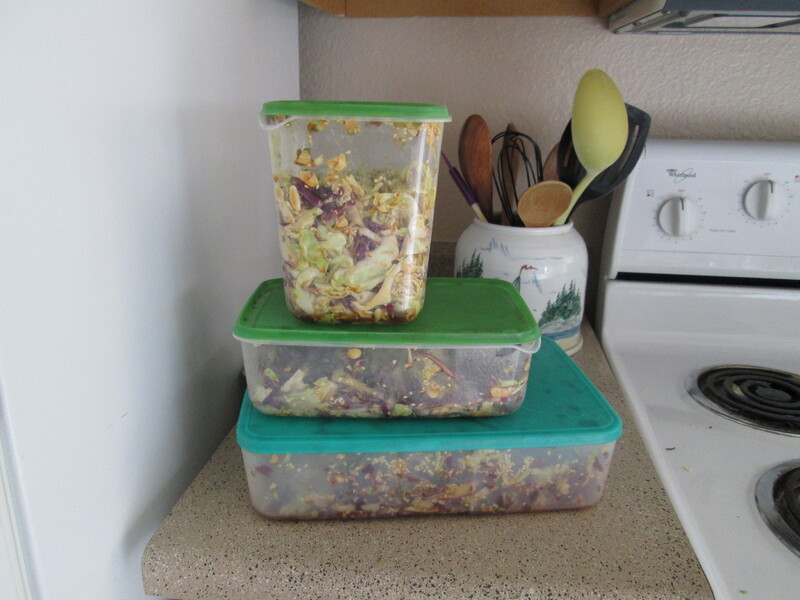 Because the salad was too big for my container, I had to use three. I tried my best to separate everything between the three containers; I think I did ok? I did buy toasted slivered almonds. I wonder if there’s a way I can make slivered almonds at home. I was worried about being able to cut them without chopping off my fingers, which is why I bought them this time. PS- I wish I knew how to embed videos. If you know, can you help me out?